Note how the VDS vertical digger system keeps the cab on a level plane when the undercarriage is angled. The 50Z3 VDS has its engine placed at the side of the cabin and allows for absolute zero tail swing. Josh Simpson worked the machine on every possible incline. Simpson says he felt comfortable making this relatively steep descent. Our tester admires the on-board fuel filler and wishes he had one on his own machine. 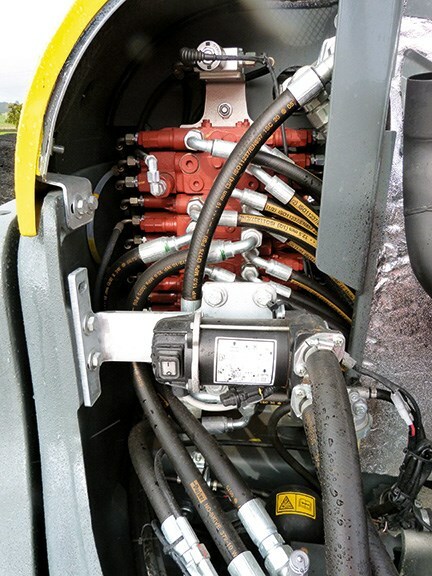 Hydraulics incoporate an unpressurised hammer return system and hydraulic quick-hitch. The huge engine cowling allows for easy access when servicing components. DOW invited Josh Simpson, owner/operator of All Kiwi Siteworks, to be this month's guest machinery tester. 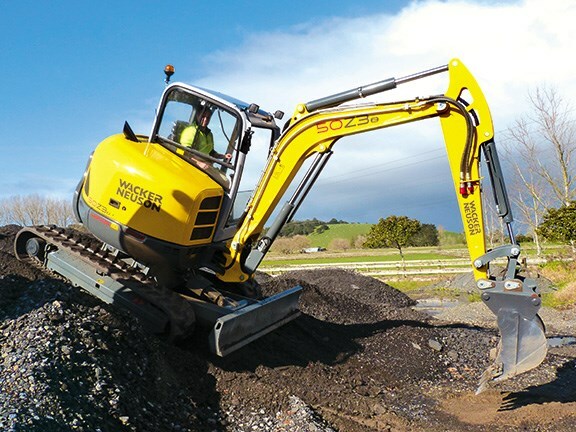 Simpson, who operates a 3.5-tonne excavator in his West Auckland business, went along with Lyndsay Whittle to see how the Wacker Neuson 50Z3 VDS performed. The mission was to carry out a test on a mystery machine at Alfriston, about a 50-minute drive from home base. There was an air of tension surrounding this particular test, as on this occasion neither Simpson nor I were completely certain as to what machine was to be put through its paces. At this stage, all we knew for certain was that we were meeting a couple of the guys from Diggalink and that the test was to be carried out on a Wacker Neuson product. On arrival at the test site we were met by Daniel Fairbrass, Diggalink's sales manager and company owner, John Giltrap, who had both done a great job of displaying about six machines on a stockpile of road millings. We both agreed it's not often you get to choose the particular machine you wish to test — which of course was the next matter to be considered. The machines on display ranged not only in size but in application as well. 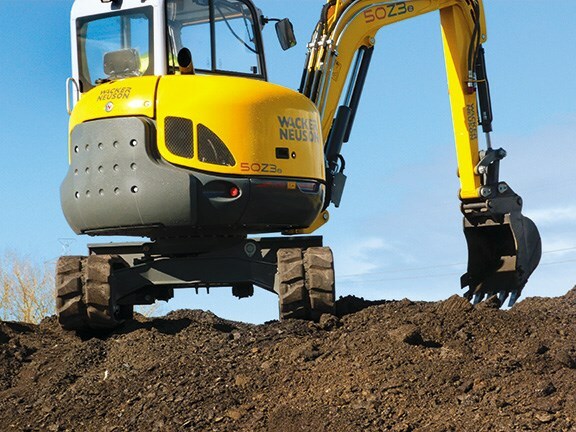 The smallest of which was a self-loading, rubber-tracked dumper and the largest, a 50Z3 five-tonne excavator. In between, there was a 1.8-tonne machine with expanding tracks and a three-tonne model, and the machine that caught this writer's eye was a wheeled skid-steer loader with a four-in-one bucket. However, it was decided the machine to be critiqued today would be the 50Z3 five-tonne excavator. 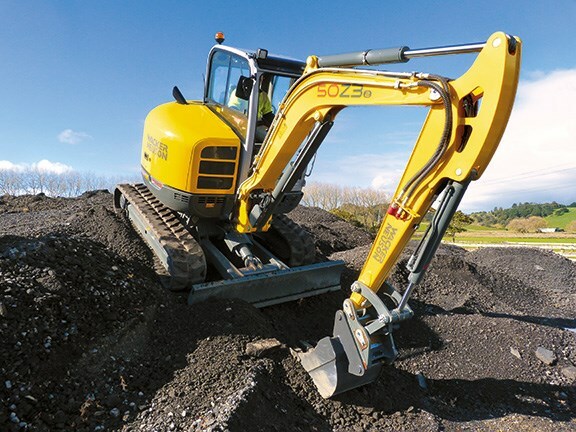 After a ten-minute briefing on the machine's added features, such as the VDS tilting mechanism and an incredible dual-function windshield which allows the bottom pane to be elevated to an overhead position, Simpson headed to the top of the stockpile to put the machine through its paces. What took place at the top of the pile of millings was a stint that lasted for the better part of a couple of hours, in which Simpson tried the machine at every inconceivable angle. It took some time for me to get used to the tightness of the controls, as this is the newest machine I've operated in a working situation, even after the time I've spent on it today, it's still only has eleven hours on the clock. It was exceptionally quiet to operate and I really liked the VDS vertical digging system where I was able to tilt the cab to sit on a horizontal plane when the undercarriage was operating on an angled surface. Although it did take me a while to remember to return the cab to the normal position once I'd moved the machine to level ground, which left me wondering for the first wee while, why I was still operating the machine on an angle. Having said that, I can see the function would be very useful when forming a batter near a building or a high bank, also from the point of view of maintaining good posture at the controls. I must admit that initially I felt the machine gave the appearance of being unstable when moving forward or backward, but I soon realised this was probably due to the machine being of a zero-tail configuration, something I needed to get used to. 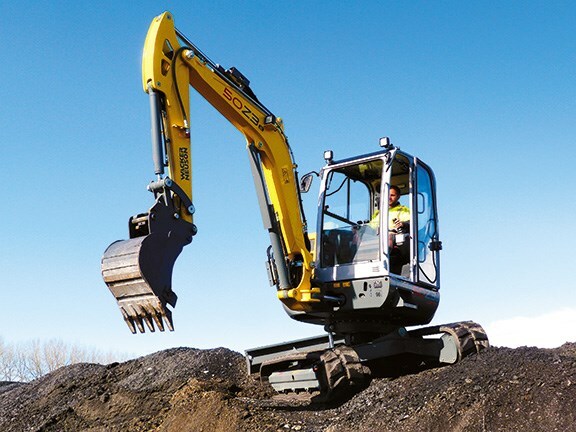 I've spent my entire working-life on conventionally-configured excavators where you have that counter-balance effect — I guess it just comes down to getting a feel for the machine. There was just one small dislike I had and that was the blade lever, which was also connected to a foot control, was difficult to access due to its positioning behind a console of switches. That aside, all the other controls were within easy reach and the sitting position was great. 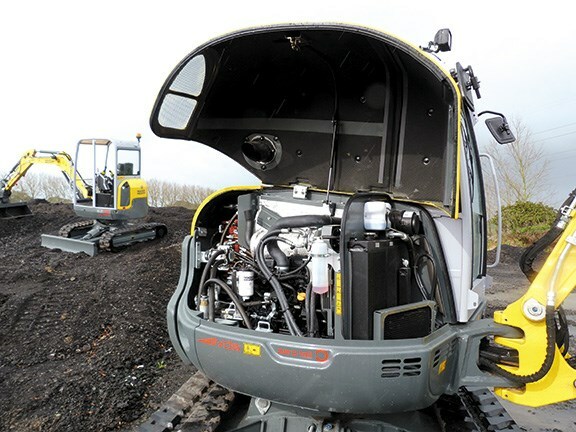 A couple of great selling points for me are the easy access to the side-mounted engine compartment, particularly for daily servicing, and the hydraulic quick-hitch attachments. Oh, and I almost forgot — the on-board fuel pump whereby diesel can be pumped into the machine from ground level, rather than having to lift a container or a nozzle up to the fuel tank filler. Overall, I thought the 50Z3 provided a high level of operator comfort, as well as being very quiet and having plenty of power and traction. The cushioning effect of the unpressurised hammer return system was a really nice feature, too.